Pong is a fun hands on party game for two that can be grown into a game for everyone or for a couple teams. Just like the larger version, players try to get the ball into the cups by following the simple game rules. This mini portable version lets you transport it and play more easily. 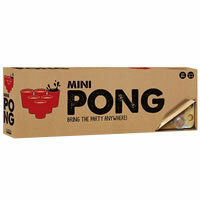 Mini Pong is a cute, small version of it's big brother. You don't need a larger space for the full size board, this little game will fit just about anywhere. Be sure to check out the official Mini Pong game rules and instructions below so you know all the exact rules on how to play. There are sure a lot of versions out there so insure everyone is on the same page before starting. Order you Mini Pong game today. The first team to remove all of their opponent’s cups from the board wins the game. Inside you'll see 1 game board, 2 launchers, 25 cups, 1 ball/string combo tethered to round base, 1 mesh bag and the official Mini Pong game rules and instructions. Please keep in mind that the official Mini Pong party rules and instructions could be different depending on the game version you have. The rules below are some of the exact directions on how to play Mini Pong. Share with us your comments, funny stories, tips, advice, strategies, creative ways to play, questions about how to play, problems with the rules or anything you want about Mini Pong. All submissions will be reviewed within 24 hours. Click here to add your Mini Pong comments.